For me this is the ultimate comfort food, and it’s also my favorite food from my years overseas. It’s a great weekend soup, but it’s also a celebration meal for the Bogotanos who often make very large pots of this soup for festive occasions such as Christmas. They typically serve the soup in black bowls just like the one in the photo, sitting in a basket because the bowls are rounded, not flat, on the bottom. Sides include rice, capers, and avocado. I’ve missed the wonderful ajiacos I enjoyed in Bogotá, so this year I wanted to have it as part of our Christmas celebration. 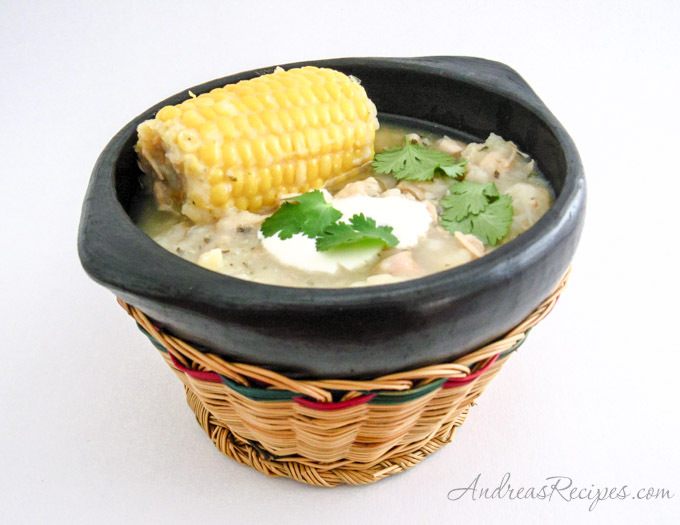 There are several versions of ajiaco in Hispanic culture. Ajiaco Bogotano has chicken, three different kinds of potatoes, corn on the cob, and the herb guascas. The potatoes are papas criollas, sabaneras, and tocarreñas, or yellow, red, and white potatoes respectively. Of the three, the papas criollas are the most importantfor this soup. They are tiny yellow wild potatoes that grow at high elevations, and they break up and dissolve almost completely as the soup cooks, thus infusing the soup with a wonderful richness. I’ve found two online merchants that sell jars of papas criollas, which will do in a pinch (see the Resources below). Guascas (Galinsoga parviflora) grows in areas with a reasonably moist warm season. In North America it is known as the weed Gallant Soldier, and apparently it’s pretty invasive so I don’t plan to grow any in my garden; however, if you know how to identify it you may find a treasure trove locally. Just be careful that it hasn’t been sprayed with any toxic weed killers; otherwise, check out the online sources mentioned below. The corn on the cob, or mazorca, used in Colombia is different from the typical sweet corn you find in the U.S. The kernels are larger and a bit tougher, which means that you have to cook them almost from the beginning to tenderize them. Since sweet corn is already tender, you simply add it during the last 30 minutes of cooking. The garnishes are all available at many local grocery stores, although you’ll want to be sure to use Crema Mexicana rather than regular heavy cream. It’s a combination of sour cream and heavy cream, and the dollops sit very nicely on top of the soup. You can also make your own Crema Mexicana, but plan ahead as it takes about 24 hours before it’s ready. I have made my best attempt to approximate the wonderfully rich soup that I remember from Bogotá, but I would certainly love to find some fresh, not canned, papas criollas. If you know where I can get some fresh papas criollas in the U.S., please share the information in the Comments. That would make my year! The soup tastes best when it has cooked for at least 4 hours, so start peeling those potatoes early and allow plenty of time to simmer. You can freeze this in 32-ounce containers. Place the chicken breasts in the bottom of a large stock pot, sprinkle with a handful of guascas, and add water. Bring to a boil and cook until the meat is tender. Remove chicken and set aside. Cover with foil and keep warm. Add the potatoes and bring to a boil. Reduce heat and simmer, covered, for at least a couple hours, 4 hours is best. The yellow potatoes should start to break up in the soup, but if not, you can help the soup along by mashing some of the yellow potatoes in the pot. Once the cooked chicken is cool enough to handle, remove the skin and bones. Cut the meat into small pieces and drop them back into the pot. About 5 minutes before serving, add the remaining guascas and let it cook for 5 minutes, then serve. I’ve been to a few restaurants in Colombia that served the ajiaco with a quarter of a roasted chicken on the side in addition to the regular sides. Papa criolla can be purchased at some latin markets in the DC metro area frozen. We’ve tried the yukon gold and the jarred papa criolla, but the frozen is the real thing and does all the right stuff to the soup. The brand we have right now is “Canoa” and they call it in English “yellow baby potato” and then of course papa criolla in Spanish. The market we go to is “La Fonda Paisa” in Silver Spring, MD. Deanne, thanks so much for the tip on the papas! I’ll keep my eye out for the little frozen gems! I know it’s been quite a while since you asked, but you can now find papa criolla at Giant Food Stores. 🙂 making ajiaco right now! If and when you go to London, ON you can find papas criollas at the Hernandez Variety on Thompson Road. J: Guascas is an herb that grows wild, and is in fact considered an invasive plant in the U.S. (see links above) If you don’t have any growing in your back yard, you can order dried guascas online from Hatogrande or Amigo Foods. My fiancé is from Bogotá and when we were in the grocery store one day he pointed out the tiny dutch creamer potatos and said they were the same as the papas criollas. I follow your instruction and it turn out a great celebration dish, thank you much. Sylvia, I’m so glad you liked it! hello Andrea…well my mom gave me the same recipe you have…which means that most o be good!!! but I have one ?, she said that I should add the patatoes by steps, first red patatoes, then Rosset and finally yellow…could that change the thickness of my Ajiaco? she said that this little thing is as important as guascas in the soup…HELP I need it for this Christmas!! Well, to be honest I’m not sure! I didn’t learn to do it that way, and none of my written sources mention it. That being said, if this is your mom’s secret to making the ajiaco even thicker and richer, then I’m all for it. I’ll have to give it a try! My husband is colombian and his family serves this soup for christmas. The frozen papas criollas are easy to find in latin markets. Birds eye also sells them. My grocer will order them for me if I ask. The Peruvian or Colomian corn really makes a diference in the soup because it is not sweet. It is worth the longer cooking time if yoou can find it. I loved your recipe only two things were missing the Green Onions & two cloves of garlic , my mom is from Bogota. Adrian, thanks for the tip about the green onions and garlic. I’ve never had ajiaco with those before. I have twin boys we adopted from Bogota Colombia when they were just two months old. We are getting ready to celebrate their 7th birthday this weekend and they want a traditional Colombian birthday party. While I was in Colombia for quite some time, I was fortunate enough to stay with some wonderful people who filled me full of many traditional Colombian foods. My favorite was the ajiaco. I am hoping to make this for the boys’ birthday party and I have just a couple of questions. First, how many servings does this make? Also, I noticed there was no salt or chicken bullion of any kind in this. Does that leave it a little bland? 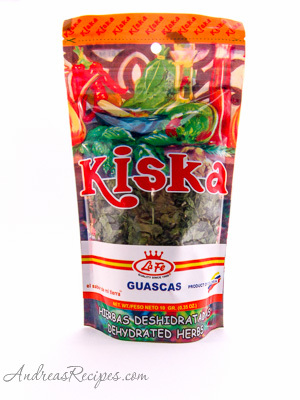 I brought home a couple bags of the Kiska guascas when I came home from Colombia, but it has since expired. Do you think I could find this at a Latino market? I can’t wait to try this – thanks!! Hi Barbara! I don’t have precise calculations on how many servings this makes, but my estimate is 10 or so. This is a relatively small batch, as many recipes I’ve seen use 3 whole chickens plus pounds and pounds of potatoes! As for the flavor, if you use a whole chicken you won’t have bland flavor. When I first started making it my husband wasn’t really keen on dark meat, so I stuck with breast meat but would add a little bouillon to give it some flavor. We don’t add salt, and I don’t remember ever seeing the maid add salt. This is pretty how much how she fixed it. I’ve never found guascas at a U.S. market, but I’m sure there are some around the country that carry the stuff. I ordered my stash from Amigo Foods (see links in the post). I went recently to Bogotá to meet an internet friend for the first time and she introduced me to Ajiaco. I ate it in several different restaurants in Bogotá. I am going to make it this week and I asked my lady friend if your recipe is accurate and she said it should be perfect. I found the guascas and papas criollas at Latinas Americas supermarket in east Orlando, Florida. There is also a Colombian restaurant here (Gloria’s Cafe) that serves DELICIOUS ajiaco on Thursdays. I can’t wait to try this recipe!! My friend from Colombia turned me on to ajiaco. I LOVE THIS STUFF! Glad to find a simple recipe for it on the web. Thanks! yo soy bogotana y es super chevere que dediques este espacio para hablar de nuestra deliciosa comida…. Jessica: Gracias por visitar mi blog. ¡Disfruté de cocinar en Colombia! I live in the south of France now and I noticed you had american substitute potatoes instead of papas criollas. I don’t suppose you have ever heard of the European Version? Andrea Puedes comprar las papas que necesites en Weston Florida tenemos un supermercado Colombiano. Andrea: Received a package of guascus from a native of Columbia about a year ago. It does not have an expiration date on it. Do you think it is still usable? Hi Pauline. Yes, as long as the guascas has been stored away from bright light and kept sealed, it should be fine to use. Andrea, my mother has alwasy been able to find guascas and frozen papas criollas in Colombian bakeries in Miami. I live in Tampa and am hoping to be able to find also so I can cook my first ajiaco this Christmas! Andrea, my mother has alwasy been able to find guascas and frozen papas criollas in Colombian bakeries in Miami. I live in Tampa and am hoping to be able to find also so I can cook my first ajiaco this Christmas! Oh, and my mother is from Bogota and definitely uses scallions. I am very very glad you enjoy ajiaco so much. I am colombian, and I found this website because I want to try to make Ajiaco this weekend. But I have to make a comment (don’t take it wrong). Bogotano doesn’t have an accent. Bogotá does. Just wante to point that out if you’d like to correct the work on this site. I live in Tennesse and I love Ajiaco soup. I want to growth my own guascas because fresh guascas gave better flavor to the soup and I want to find seeds in USA. could you give me directions to find them? Hi Luis. The plant grows wild in the U.S. (aka gallant soldier), but it’s considered an invasive weed in most states. I’ve searched but have never found a source of seeds. If you ever find some seeds, feel free to share the source here. If you want to have some pointless fun, ask your local agricultural extension representative about how to grow guascas (galinsoga parviflora). It’s kind of like asking how to grow dandelions, or asking a doctor how to get sick! Around here it grown on the fringes of corn fields, but who knows what they spray so I haven’t picked any…I use the dried stuff. I use the frozen papas criollas that are sold in some markets in the DC area, and they work fine, but in the past I’ve done OK with US varieties boiled separately and then pureed with an immersion blender, then added to the main pot. Just a couple of weeks ago a Colombian friend made ajiaco for me. I almost died of delight. I’m from Venezuela and we’re used to eating our sancocho de whatever, but I have to say that there’s nothing as heavenly as the ajiaco colombiano. I’ll take an ajiaco over a sancocho any time. I was wondering if you know a place here in NY that sells the Guascas?? I am making ajiaco for a few friends on sunday, but I am missing the herb. I have a friend who is actually flying in tomorrow from Bogota, but I am doubdtful he will bring the ‘encargo’. I am not convinced about adding cilantro instead…its a very different taste. Thank you! Hi Mauricio. I’m not from NY so I’m afraid I can’t recommend any places to you. I just know of the online stores mentioned in the post that sell guascas. I hope you find some. I went on a quest to find guascas this past weekend. i was able to find dried guascas in Queens at a Colombian grocery store named Rivera Grocery. It’s located on 82nd street right off the 7 train. Good luck! papas criollas are very easy to grow. if you happen to get them “fresh” in the market,keep one or two in a cool dark place over the winter. after a while they start to grow, then plant them in the garden in early spring… and then you will enjoy them late summer/fall. as for the next years go, I keep some in the ground over the winter and then in early spring I dig them up and replant them or you can keep them in the frige, but sometimes they go bad (they have a lot of water). I live in WA state, they like regular garden soil and lots of sun, but not too much heat. My mom tried to grow them in souther california, but they didn’t do well… As for the guacas go, I got a handful of them growing in a garden pot… and so with this in mind, I will for the first time ever… will try to make the famous sancocho bogotano… thanks for the recepie. How wonderful that you are able to grow your own papas criollas and guascas. I have never come across them at a market or even seeds for the guascas, but will surely keep my eyes open for them. Thanks for the growing tips. How long will the papas criollas last in a dark cold place or in the fridge? Will they last 4-6 months? I live in the UK and always bought the guascas dried, since I saw the plant i research about and found out it was taken from SA to Kew Gardens and the seeds escape and it can be found growing wild. I decide to go and look around and certainly I found it growing beside the river. I pick a few plants and cuttings and have some growing in the garden and some growing in a glass with water. It is the easiest plant to grow, it’s like a weed. I have not use it yet because I don’t know if dogs had wee on it or anything put on them; I will wait until I am happy it’s clean; maybe next year. I normally marinate the chicken with salt, black pepper, garlic the day before to give a better flavor. yes… the guacas o guascas are a weed, I grow them in a pot and now that is getting cold, I got some stalks in a glass of water, just like you did. during the winter, I will grow them like a house plant (will have to transfer them to some soil) and then in the spring they can go back outside (plant them sideways… they will grow with many roots. and the papas criollas… make sure they are dry (air dry) before you store them in the fridge. you can leave them in the garage inside a shoe box, but they start growing sooner than in the fridge… I put mine inside a paperbag with some paper towels around, to absorb moisture…. I have been doing this for a few years now (I’m not an expect, but that works for me). choose the potatoes of lighter color (the darker ones and bigger ones, I found, don’t store well)… once in a while I check them and change the papertowel… got to keep them dry…. and yes…. you can keep them for 4+ months, By spring, they will look wrinkle and ugly, but once they go back in the soil…… they will make it. Andrea thanks so much for your ideas, I’ve wrecking my brains trying to find an ajiaco recipe that will give substitutes for the ingredients not easily found in the states. Now my gringo husband can have an authentic Colombian Christmas eve dinner. I smuggled a bag of papa criolla I purchased in El Exito in Colombia back to Canada. I now have a batch growing in my garden, and a constant supply to satisfy every Ajiaco craving I could ever have. Great idea Nico, I thought of it, but was concerned that they would be removed from my luggage. Would you be willing to mail me a couple of potatoes (I live in BC) so we can plant them in our garden too? Nico, lemme get in on this potato share!!! If you can’t find guascas, I’ve found that a combination of a handful of fresh oregano, a half-handful of fresh thyme, and a generous handful of fresh cilantro works. When I made the soup that way, my Cachaco husband said it was better than his mom’s–something he never said before or since! Thanks for this great recipe. I can’t wait to try this weekend. I am from Bogota and I have been dying to duplicate the amazing Ajiaco that I would have everytime I was home. I just have a quick question. In step 1 where you say to add water to the chicken, do you put the entire amount of water at the very beginning to cook the chicken or just part of it? You put no other spices in the water? Hi Andres. Per step 1, sprinkle a handful of the guascas over the chicken before adding all the water. You want all the water in the pot while cooking the chicken so it picks up all the flavor. I have a question about the amount of Guascas. I found dehydrated Guascas at my local international supermarket. The package is 0.35 oz and I’d say about two handfuls. You reference 2 ounces and I’m assuming this is for fresh and not dehydrated. Can you give me an idea of whether or not I should use the whole package or just a portion of it? Hi Claire. You are correct, that is for fresh guascas. For dried, I end up using about half of one of those packages for the soup, about 5 grams total. I will make a note in the recipe. my girlfriend is a Costeño so not sure if there is a coastal variation of ajiaco, or if she just used different ingredients out of necessity or was unable to find authentic Colombian ingredients. Instead of dollops of heavy cream, she adds chunks of creamy havarti cheese just before serving. The heat from the soup softens them up even more and makes it extra creamy. She also chops some fresh cilantro and puts it in a bowl on the table. Just add a spoonful to your own bowl and take in the aroma as the heat intensifies it. Very nice. For Karin in Toronto, you can find frozen papa criollas at Columbus Bakery on Dufferin just south of Lawrence. Anybody knows where can I find Colombian corn on the cob in the DC area? I wish I knew where to find some around here. If anyone comes across Colombian corn please feel free to share the info! Try http://www.emergingmarkets-us.com/Products-Colombia.html you can order pretty much all products even frozen ones online. They have guascas for 99 cents each pack. Is that a real store? I did google search (streetview), and that address is a house not a store. At this point, I’m not sure if that’s a real business or a scam. I wanted to buy guascas from that site, but it does not seem to be a real business, and there are not online reviews either. They seem to accept paypal. By the way the price went up: 1.99 .
i am living in bogota right now and am kinda a cook at heart and learned from my mother in law here that with the guascasare for the last 15 to 25 minutes and while cooking the chicken use a whole pack or bundle of cilantro and some onion. have always loved the smell and flavor of quascas. just wondering . . . are there any other colombian recipes that call for quascas? Here is a Colombian recipe of chicken with Guascas. Well, I have a jar of dried Guascas that I brought back after living in Bogota in 1978. I have the cookbook from the Bogota American Women’s Club and made ajiaco many times in the 80’s but haven’t made any for a long time. I think my jar is expired, but I keep it in the cupboard as a souvenir. The best ajiaco we ever had was out at a restaurant at a ranch in the hills. Good times. Thanks for the memories. I lived in Colombia 2 years and also used the American Woman’s Cookbook. As I remember it, didn’t we use some yucca in the ajiaco? I noticed ready-to-use packages of vegetables for ajiaco in Shop for Less that included yucca.with the potatoes. My great great aunt tocuhg me how to cook a real ajiaco Santafereño when I was 8 years old. althoug she has pass a long time ago, I think I need to give her a well-deserved credit. Mrs. Rebeca Hernandez de Naranjo, has a few little tricks to make the best ajiaco. I have won a couple local food competitions with this secrets. • Potatoes should be add on on steps. Lina was right on her comment. first red potatoes, then Rosset (or white potatoes), and then finally yellow (papa criolla). But not only that, potatoes should be layered every 15 minutes, so every 15 minutes you should add 1 pound of potatoes, starting with the red kind. The reason for this action is to assured that creaminess and multi-layered flavor characteristic of a great soup. • BEST TRICK: ” DON’T CUT THE POTATOES WITH A KNIFE. cut chunks of potatoes with a spoon. My great aunt insisted that the starch was sealed inside the potatoes when you used knifes. when you use a spoon you will see how the starch just “pops” and covers your hands while doing it. You will see how incredible of a difference this little trick makes. • Add a quarter pound of arracacha at the very beggining with the first layer of red potatoes. The arracacha (Arracacia xanthorriza) is a garden root vegetable originally from the Andes, somewhat intermediate between the carrot and celery. Its starchy taproot is a popular food item in South America. You might be able to find some in local Hispanic Markets. They are called white carrots. Arrachacha will add a subtle depth in flavor and taste, making it surprisingly smooth. • Guascas should be preferably fresh, but in a pinch use the dried kind. If you are using the fresh guascas add a bunch of the herbs, very well tied, when you are boiling the chicken, and remove it before serving. Guascas can turn a litle sour if you decide to freeze your leftovers. • Use a whole chicken instead of the chicken breast. Save the chicken stock you used to boil the chicken and use that as a base for the soup. • Take 1/4 cup of chicken broth and boiled the chicken’s skin for 5 minutes, after that time get rid of the skin and add the leftover liquid to the broth used as a base for your soup. • Use very little salt (1 spoonful for every 12 pounds of potatoes. Cappers are traditionally added right before serving and they are particularly salty since they have been pickled in the jar. It might seem like it would need more salt but they won’t. Worst case scenario is best to add salt to taste. This would make of your ajiaco the best family recipe and you can pass these secrets along to the new generations. Just give some credit to my great aunt Rebeca, while you are telling the story. Hi Patricia. Yes, those are frozen papas criollas. Hi, your recipe with the comments below are very helpful. My nieces and nephew are from Colombia. We have special birthday meals for them with empanadas, ajiaco and rice. I was told (by a Colombian friend) to allow the papas criollas to almost dissolve to help with the creaminess as well. Hello, I making ajiaco today but I am using boneless chicken breast. Can I chicken broth instead of water or both and how should I cook the chicken breasts kin with the the soup? At what point? Hi Tatiana. Yes, if you are using boneless chicken breast, you will not get the flavor from the bones and skin, so I recommend chicken broth or stock instead of water. You can still cook the breasts in some water first, then remove them and add the potatoes and stock and continue with Step 2. Let me know how it turns out!